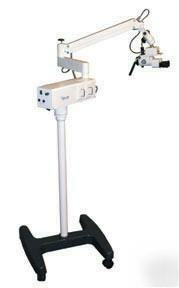 402 seiler "ent" surgical microscope w/ imaging pack. Subject: 402 seiler "ent" surgical microscope w/ imaging pack. THIS OFFERING INCLUDES THE COMPLETE IMAGING SYSTEM THAT WILL ENABLE YOU TO SHOW YOUR PATIENTS & STAFF (VIA THE FLAT PANEL MONITOR) WHAT YOU ARE SEEING UNDER THE MICROSCOPE.....EXCELLENT FOR PATIENT & STAFF EDUCATION. WE ALSO SELL DIGITAL STILL CAMERA ADAPTERS FOR DIGITAL IMAGE CAPTURE & ARCHIVAL STORAGE OF PATIENT IMAGE FILES. THERE ARE MANY DIGITAL STILL CAMERAS ON THE MARKET BUT NOT ALL ARE CONDUCIVE TO MICROSCOPIC IMAGING. PLEASE EMAI US IF YOU ARE INTERSTED IN DIGITAL STILL CAPTURE AND WE WILL EMAIL YOU OUR RECOMENDATIONS FOR THIS APPLICATION. CLICK TO SEE OUR COMPLETE LINE OF SURGICAL MICROSCOPES. WE HAVE BEEN IN THIS BUSINESS FOR 25 YEARS AND WE HAVE NEVER SEEN A BETTER "ENT" SURGICAL MICROSCOPE IN THIS PRICE RANGE THAN OUR SEILER 202 & 402 SERIES DENTAL/SURGICAL MICROSCOPES. THIS IS BY FAR THE BEST PRICE AVAILABLE FOR A DENTAL or ENT MICROSCOPE OF ALL THE MAJOR COMPETITORS IN THIS PRICE RANGE! JUST CHECK OUT OUR TO READ THE TESTIMONIALS OF THE MANY SATISFIED DENTISTS & MD"s WHO HAVE PURCHASED SEILER MICROSCOPES. 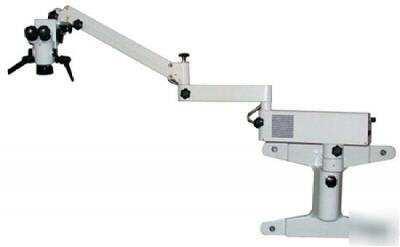 THIS SEILER SURGICAL MICROSCOPE is SPECIFICALLY DESIGNED for "ENT" SURGICAL SPECIALTIES. THIS UNIT IS BRAND NEW and comes with a FLOOR STAND. ALSO PICTURED IN THE IMAGES FOR YOUR REFERENCE IS OUR 'WALL MOUNT' and 'CEILING MOUNT'. PLEASE CALL OR EMAIL US FOR PRICING ON THESE MODELS SINCE THE PRICING IS DIFFERENT THAN THE FLOOR STAND MODEL OFFERED IN THIS AD. PLEASE NOTE: SOME OF THE IMAGES SHOW 'INCLINED BINOCULAR HEADS' BUT THIS OFFERING INCLUDES THE 'STRAIGHT' BINOCULAR HEAD WHICH IS DESIGNED FOR "ENT". 1.) DUAL PORT BEAM SPLITTER (ACCEPTS 2 CAMERAS SIMULTANEOUSLY); 2. )VIDEO CAMERA ADAPTER; 3.) HIGH-RESOLUTION SURGICAL GRADE COLOR VIDEO CAMERA w/ S-VIDEO by MINTRON; 4.) 19" FLAT PANEL LCD MONITOR/STEREO SOUND; THIS IS A COMPLETE PACKAGE INCLUDING ALL ACCESSORIES & ALL CABLES & CONNECTORS NECESSARY TO "PLUG & PLAY" RIGHT OUT OF THE BOXES. DIGITAL NOTES: SEILER DOES NOT SELL DIGITAL STILL CAMERAS. IF YOU WANT TO TAKE DIGITAL IMAGES YOU WILL NEED YOUR OWN DIGITAL CAMERA AND ONE OF OUR DIGITAL ADAPTERS. THE TYPE OF DIGITAL ADAPTER REQUIRED IS DEPENDANT ON THE TYPE OF DIGITAL CAMERA YOU WILL BE USING. NOT ALL DIGITAL CAMERAS ARE SUITABLE FOR MICROSCOPIC IMAGING. PLEASE LET US KNOW WHICH DIGITAL CAMERA YOU WANT TO USE AND WE WILL EMAIL THE SPECS TO YOU FOR THE CORRESPONDING DIGITAL ADAPTER.